Gel-E-Roll wrap around area to provide scar, edema control. Also ideal for pain reduction. This elastic bandage is coated with Silipos gel to protect the skin from friction, abrasion and pressure. Adhesive gel adheres to skin without slippage. 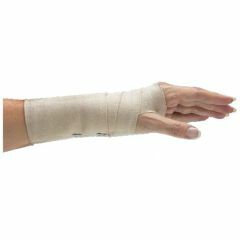 Gel bandage is soft and elastic, allowing it to conform comfortably around any bony prominence. Bandage can be cut without fraying the material. Medical-grade mineral oil released from the gel onto the skin helps soften dry skin and improve scar tissue mobility. Use for edema control, cold therapy and bursa problems. Just chill and apply to help reduce muscle strains, arthritis pain, or contusions. Dermatologist-tested, hypoallergenic, hand washable and reusable.